Sustainable remediation is a key element of Honeywell’s efforts to clean up Onondaga Lake. This winter, workers finished installing two wind turbines and solar panels on Honeywell property in the Town of Camillus. The wind turbines and solar panels will provide a renewable source of electricity to help power the water treatment plant at the consolidation area and the pump station along I-695. 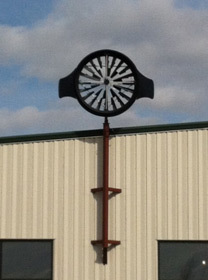 Two 6-foot, 185-pound wind turbines were installed on top of the water treatment plant at the consolidation area. Each turbine is estimated to produce 1,500 kilowatt hours a year, or about 15 percent of an average household’s annual energy needs. Honeywell Wind Turbines will provide supplemental renewable energy to help power the water treatment plant at the consolidation area in Camillus. The newly installed 200 large photovoltaic (PV) solar panels, near the Gere Lock Road exit off I-695, cover more than 3,000 square feet. The panels will convert sunlight into electricity, producing in excess of 100,000 kilowatt hours per year, which will be used to help operate the pump station. 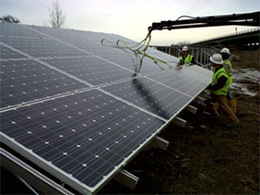 Workers install solar panels. I-695 can be seen in the background. 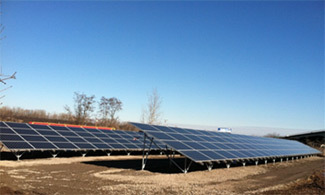 Two-hundred PV solar panels will provide 30 percent of the electric power required to operate the pump station annually. Both initiatives align with the New York State Department of Environmental Conservation’s Green Remediation Policy and the Environmental Protection Agency’s Superfund Green Remediation Strategy. For more information on Honeywell’s sustainability initiatives, click here.